Welcome to another Brian’s Travel Spot. In case you’ve not been paying attention, I’m in Shanghai, having flown out two weeks ago for a week of work, followed by a week of sightseeing and Coffee Spotting. Having visited Shanghai last year, I was keen to explore a little bit more of China and, buoyed by travels by train in both Japan and Vietnam earlier this year, I contemplated taking the train to Beijing. A little bit of research on the ever-useful The Man in Seat 61 showed that the train was considerably cheaper than flying and a lot more convenient. Not only that, as long as I caught the right train, I would be travelling on the world’s second-fastest passenger rail service, which appealed to the geek in me, especially since I’d already travelled on the world’s fastest passenger rail service when I caught the Maglev train serving Shanghai Pudong airport. After further research, I decided to catch a regular high-speed service from Shanghai to Beijing on Saturday, the day after my meeting ended, returning four days later by sleeper, leaving Beijing on Wednesday night, arriving in Shanghai on Thursday morning, giving me three days to explore before flying home. You can see how the trip to Beijing went after the gallery. For once I planned the trip before I went, booking my tickets on China Highlights, one of the sites recommended by The Man in Seat 61. I went for the 10 o’clock departure which got me into Beijing at half past two, the idea being to do the trip in daylight and allow some time for a quick look around Beijing before sunset. The cost was a very reasonable 550 RMB (just over £60), plus I was able to get the tickets delivered to my hotel in Shanghai, which saved me a trip to the station to collect them ahead of time. There were various charges added to this, which totalled £20, but that was split across both tickets and included the delivery charge. The first challenge was catching the train. I was staying in Pudong, just to the east of the centre, while the high-speed services to Beijing leave from Shanghai’s new Hongqiao station, which is out to the west, just past the old airport, which is where I flew in and out of when I visited Shanghai last year. Getting to the station was easy enough, with the Number 2 metro line running from Pudong Airport out in the east and Hongqiao Airport/Station in the west. My hotel in Pudong was a 15-minute walk from a stop on Line 2, with the journey to Hongqiao Station taking about 45 minutes. So all I had to do was get on the subway and get off 45 minutes later. Except, in an interesting scheduling quirk, about half the metro services terminate at Songhong Road, the station before Hongqiao Airport. If you’re on one of these trains, you have to get off at Songhong Road and then catch the next train. Naturally, I was on one of the trains terminating at Songhong Road. The best part is that almost everyone was going to the airport/station, so we all got off to wait for the next train. This was along soon enough, but, of course, was already full of people heading for the airport/train station, making for a very cramped last two stops. The next challenge was to navigate Hongqiao station, which I found rather confusing. Coming up from metro, signs point to A/B area (left) and C/D area (right), the only problem being that I had no idea which area I was heading for. Looking at my ticket (which was in Chinese), there seemed to be something with a “B” in it, so I guessed A/B and went left. The metro deposits you in the station’s arrivals hall where there are precious few signs, no departure boards that I could see, and no-one to ask. By following the general flow, I worked out that I needed to go upstairs to the departures area, but it really wasn’t clear. It also didn’t help that the exit from the metro was in the middle of the station, with the escalators to the departures floor at the very far end, which necessitated quite a walk, all the while not being sure if I was even heading in the right direction. At the top of two flight of escalators, you find yourself in the departures hall, where I saw my first departures board (which, to my relief, had my train on it). The next obstacle is a security check. While all the luggage is x-rayed and you go through a metal detector, it’s all very cursory and nowhere near as rigorous as airport security, hence it’s much quicker. Despite long queues, I was through security in maybe two minutes. Although I’d largely chosen which direction to go at random, it turned out I was spot on. My train left from platform one, which was right next to the security gate I came in. There was another long, but equally quickly moving queue for the ticket barriers, which was the first time that I was required to show my ticket, being waved through on a cursory glance. From there, it was down another escalator to the platform, where the train was waiting. In all it took me 15 minutes from arriving at the station to getting on the train. What I’ve learnt since then is that major Chinese stations seem to have a similar layout, with arrivals at the lower level, the train tracks in the middle and the departure hall on the floor above. While this does make for a lot of going up only to go back down again, it is actually very logical and works quite well. Once you know what you’re doing, of course. What I never did work out is what the different areas (A, B, C and D) stood for and whether it would have made much of a difference if I had gone to the wrong one. 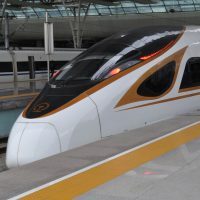 I caught the G14 service, the Fu Xing Express, from Shanghai to Beijing, which uses the new CR400 series trains, designed in China and capable of speeds of up to 350 km/h (a shade under 200 mph for those old-fashioned sorts). My particular train was made up of two eight-car sets joined together and I was travelling in the back set of eight in standard class. Although the train also has first class and business class carriages, I didn’t get to explore so can’t really say anything about them other than they exist! Back in standard class, if you are familiar with Japan’s bullet trains, the interior layout will seem very familiar, with the seats laid out in rows of five, two on one side, and three on the other, a wide aisle down the middle. These seats are fully reversible, pivoting on a central axis, so at the end of the run, they are all turned around to face forwards again, which is a neat trick. It also means that if you are travelling in, for example, a group of four, you can get two adjacent rows of two and turn one of them around to face the other, making your own set of four. If only British trains were designed like this! There are 15 rows of seats in standard class, so each carriage seats 75 when full. There are toilets (one sit-down toilet and one squatting-style toilet) plus an external washbasin at the end of each carriage, along with a hot water dispenser and extra luggage racks. That said, there was also plenty of space in the overhead luggage racks, which had generous clearance, unlike many British trains (I’m looking here particularly at the Virgin Pendolino and Super Voyager trains which have so little clearance between the luggage rack and train ceiling that I can usually only get my coat and camera bag up there). The seats themselves were comfortable, with plenty of legroom. You can also recline the seat slightly without really inconveniencing the person sitting behind you, which I found wasn’t the case on the Japanese bullet trains. If I have one complaint, it’s that the seats are pretty narrow. I found that I was banging elbows with the person in the adjacent seat on many occasions. There’s a sturdy, fold-down table, but it can’t be adjusted forwards and backwards, so because of the large amount of leg-room, the table’s a long way away. Even with my long arms, I found it hard to type without leaning forward in my seat. There’s also at-seat power, but there’s just the one outlet between the two seats, nor is it well-placed, stuck down between, almost below, the two seats, with a small lip above it, so it’s impossible to see it from your seat without considerable contortion, making it hard to plug anything in, although I finally managed it. The train has free Wifi, but the login page was in Chinese, so I never managed to negotiate it. I also suspect that, like many public Wifi networks I came across in China, you need to enter a Chinese mobile number to make it work, so I was probably doubled stuffed on this count. In defence of the railways, of the 75 people in my coach (yes, it was full), I might have been one of two non-Chinese people there, so the train is set up for the vast majority of the passengers. As it is, English speakers are already extremely well catered to, with all announcements and signs are in Chinese and English, so I didn’t feel hard done by. In conclusion, the CR400 trains are spacious, well laid-out and very well-designed. Any niggles I had with them are minor compared to, for example, travelling on any British train. You can see how I got on during the journey itself after the gallery. The journey itself was very smooth, certainly the smoothest of any high speed rail I’ve been on recently. I had asked for a window seat in a two-seater set when I book, but I ended up with an aisle seat, which is just as well given how narrow the seats were. I’d gone for the window seat because I’d wanted to watch China go flying past, but to be honest, the views were largely dull anyway, with nothing beyond the middle distance, where everything faded to a dull, grey haze. I took this to be smog, but it could, I suppose, have been fog, although I think it unlikely that there would have been fog for the whole 1,300+ km to Beijing. What scenery I could see was very mixed, as you might expect over that distance, from flat, featureless plains to a couple of mountain ranges. When it came to speed, because it was so smooth, it didn’t feel as if we were travelling very quickly. The display periodically gave our speed it, regularly claiming 340km/h, while 346km/h was the highest I saw. I was sceptical though, until I went for a walk and stuck my nose up against the window in the door. At that point we went through a station which must have been several hundreds of metres long in literally a few seconds. Thinking about it, this made sense. Assuming (for mathematical simplicity) a speed of 360km/h, we were covering 6 km a minute or 1 km every 10 seconds. Or 100 metres per second. So a 500m long station, which is a long station, would go past in five seconds. So now I believe that 346 km/h readout on the display! One thing that struck me was how well-staffed the trains were, with two distinct sets of uniforms, blue for catering and purple for train crew (mostly ticket inspectors). This high crew-to-passenger ratio, with an emphasis on service, is the polar opposite of the no frills airlines. For example, there were frequent passes up and down the train by a member of crew collecting rubbish in a trolley, not to mention there being bins, which were regularly emptied, at the end of every carriage. What was most impressive was that if anything was dropped on the floor, the crew member got out a broom and swept it up! The purple-uniformed train crew came through less frequently, although there was a full ticket check not long after leaving Shanghai, although my passport was never checked. There was also an occasional catering trolley, although it seems that you could order ahead. At one point lunch was delivered by a lady in a blue uniform to a group of 25 people in our carriage! That prompted me to make the trek up to the large kitchen/buffet counter, which was in coach six. I should have gone up earlier, but I was worried about the language barrier. As it was, it wasn’t too bad and while the menu was only in Chinese, there was a video menu which pictures. Lunch was effectively various plates with rice. I tried to order the vegetarian ones, but all three options had sold out, so ended up with a beef, chicken and fish plate with rice. Fortunately this had plenty of vegetables too and I was able to eat about half of it. Although it hurt me to leave half of it uneaten, it was that or eat nothing. On the plus side, the meal cost just 60 RBM (£7) and the food was both hot and tasty. You can read my final thoughts on the journey after the gallery. I’ve painted a fairly rosy and positive picture of the journey, but it’s fair to say that for the first two hours, I was thoroughly miserable. Much of this I can put down to my own state of mind. I was very tired, having not had any proper sleep since I’d arrived in Shanghai six days before. Jet-lag and having to be up each morning for meetings meant that I’d averaged four to five hours a night, and when I’m tired, I’m much more easily annoyed. I was also very hungry, having missed breakfast at the hotel. With hindsight, going for the 10am train was a mistake since it meant aiming to leave the hotel at eight o’clock, so what with having to pack, I was never going to have time to fit breakfast in. It’s fair to say that I didn’t really start to enjoy the trip until I’d had some lunch on train, after which I felt much better. Mind you, I’d have found the announcements less annoying if the fellow passengers who were annoying me had paid the slightest bit of attention to them. The most egregious offenders were the couple with the two young children sat directly in front of me. The children were regularly allowed to run up and down the aisle as well as frequent bouts of shouting and/or whining. Meanwhile, the parents regularly played games and videos on their phones without using headphones, both for the children and for themselves. In short, they were doing pretty much every single one of the things that the regular announcements said not to do, with the exception of vandalism and smoking. A group of six adults sat across from me also managed a good subset of these, adding insult to injury. Occasionally the carriage would lapse into silence, but it wouldn’t be long before someone started a phone call or decided they just had to play a video with the sound up. As a result, until I got some food, I was extremely grumpy, so grumpy that I might have complained if I could speak Chinese…. I should point out that there were 75 people in my carriage, the majority of whom were quiet and well-behaved (and mostly wearing headphones). Sadly, it doesn’t take that high a proportion of the passengers to make a carriage very noisy indeed. Particularly when they are sitting next to you! Bearing all that in mind, the obvious question is, would I do it again? The answer is a resounding yes, although next time I’ll try to get more sleep and I definitely won’t be skipping breakfast. I probably shouldn’t have travelled straight after my business meeting either, although I did that in Vietnam without any trouble. Next time, though, I will consider getting a seat in business class, which might be a bit quieter. You can see how I got on during my return trip to Shanghai, when I took the sleeper! This entry was posted in Beijing, Brian's Travel Spot, Shanghai and tagged China2017T0, HighSpeedTrains by Brian Williams. Bookmark the permalink.